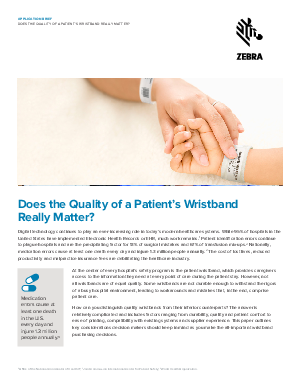 > Zebra Technologies > Does the Quality of a Patient’s Wristband Really Matter? Digital technology continues to play an ever-increasing role in today’s modern healthcare systems. While 95% of hospitals in the United States have implemented Electronic Health Records or EHR, much work remains.1 Patient identification errors continue to plague hospitals and are the precipitating factor for 13% of surgical mistakes and 67% of transfusion mix-ups.2 Nationally, medication errors cause at least one death every day and injure 1.3 million people annually.3 The cost of lost lives, reduced productivity and malpractice insurance fees are debilitating the healthcare industry. At the center of every hospital’s safety program is the patient wristband, which provides caregivers access to the information they need at every point of care during the patient stay. However, not all wristbands are of equal quality. Some wristbands are not durable enough to withstand the rigors of a busy hospital environment, leading to workarounds and mistakes that, in the end, comprise patient care. How can you distinguish quality wristbands from their inferior counterparts? The answer is relatively complicated and includes factors ranging from durability, quality and patient comfort to ease of printing, compatibility with existing systems and supplier experience. This paper outlines key considerations decision makers should keep in mind as you make the all-important wristband purchasing decisions.